Single origin spices, packed with flavour. Rooted Spices are bringing a fresh new approach to those out-of-date jars on your shelf. Beautifully packaged in little tins, with the option to purchase refills at a later date. There’s a big range of interesting spices on the website but the gift box is a nice place to start. This is such a lovely gift to receive, the box is jam-packed with new and interesting products that are handpicked by the LifeBox team. It’s so beautifully presented that you *almost* don’t want to open it. Everything in the box is gluten and dairy free and suitable for vegans. An introduction to meditation via the medium of chocolate. According to Food at Heart, chocolate has more flavour compounds than wine so it makes the perfect partner for practising mindfulness. The Slow Chocolate Tasting Kit contains a selection of treats to savour alongside a booklet to help guide you through the tasting and meditation practice. The chocolate itself is absolutely delicious and further, the packaging Meredith uses is made using recycled materials and is compostable, recyclable or biodegradable. Newly launched for the home cook, Pump Street Chocolate have produced a range of pastilles for baking. These are great for melting down into mixtures, ganaches or chopping up to use in bakes. Pump Street go one further than single origin - they make an extensive bean to bar chocolate range and each bar can be traced back to the single farm the beans came from. A unique gift, the story behind how argan oil is produced and how Arganic came about is just as special as the product itself. 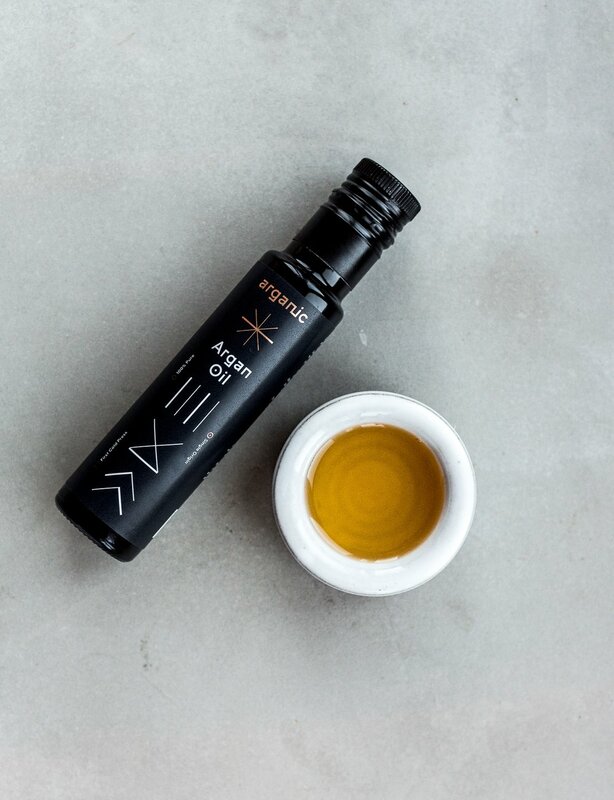 Arganic are purveyors of 100% pure and authentic Argan Oil. I have one bottle in the kitchen and their beauty version in the bathroom at all times. Use it for dipping into bread, making salad dressings or my recent discovery, amlou - a honey, almond and argan oil paste. I bought some of Rock My Bowl’s Cacao & Sea Salt blend for friends last Christmas but this seasonal blend would also make an excellent gift or stocking filler. Good luck getting this one anywhere near a bowl, I usually eat it straight out of the packet for a sweet hit after dinner. This seasonal blend also inspired the latest brownie collaboration at EK BAKERY. 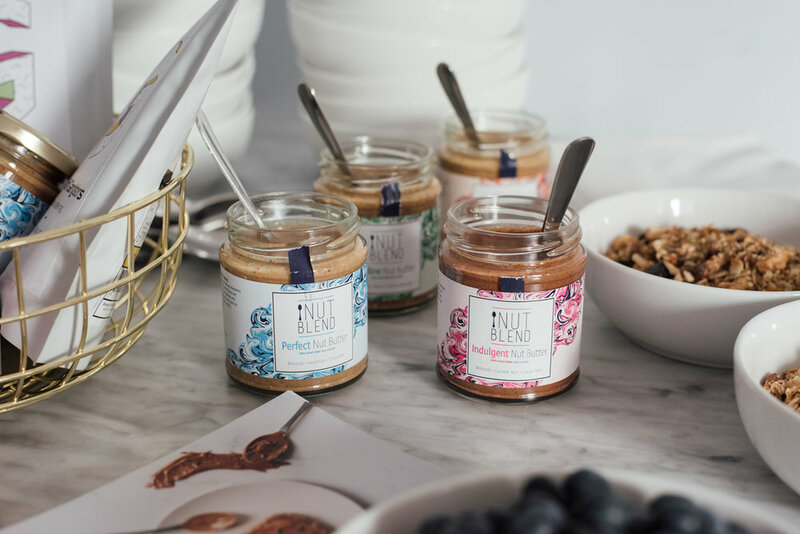 Nut butters got a serious upgrade at Nut Blend. Not a peanut in sight, the range includes a variety of blends involving coconut, macadamia, pecan, almond, cashew and hazelnut. Each flavour is unique and carefully balanced. Handcrafted pottery in pretty designs and soft colours. I received a Karin Hossack plate last year and I haven’t stopped using it, it’s super durable and I loved the scalloped edge design. There are lots of different styles to choose from or you can request a custom order. My copy of A Modern Cook’s Year is covered in splatters and stickers - a good sign! Like all treasured cookbooks, there is so much more to take from the book - techniques, flavour combinations and hacks for nutritious and quick meals. The recipes in this book are arranged into seasons, peppered with one of my favourite elements of Anna Jones’s books, these flavour maps (pictured) guide you to build a meal from scratch, with whatever you have available. I was so thrilled to discover these illustrations. There are two ranges from Letitia Ann Clark - sensical and non-sensical. The sensical capture the beauty of a variety of fruits and vegetables whilst the non-sensical are so fun, I could look through them all day. Any of them would look great framed in the kitchen. 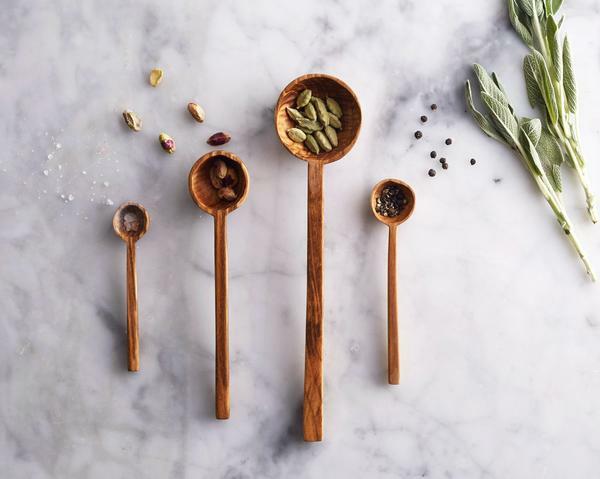 I came across these delightful wooden spoons via Rebecca (founder of Rock My Bowl) - they’re made in the exact sizes of measuring spoons so they’re great for baking or for loose tea. There are so many other expertly crafted homeware items to browse through on Minor Goods too. So far Cook for Syria have raised an impressive £700,000 from the books, events and restaurant collaborations. Proceeds from these books are donated to UNICEF. Asides from money going to a great cause, the books are filled with a brilliant selection of recipes from chefs who have kindly donated their time to the cause. Share your surplus food this Christmas with OLIO, an app which is making reducing food waste super easy - users collect from your home or business at a time suitable for you. The beauty of the app is that you can share as little or as much as you have- from half a lemon, to a leftover portion of Christmas pudding or a turkey sandwich with all the trimmings. 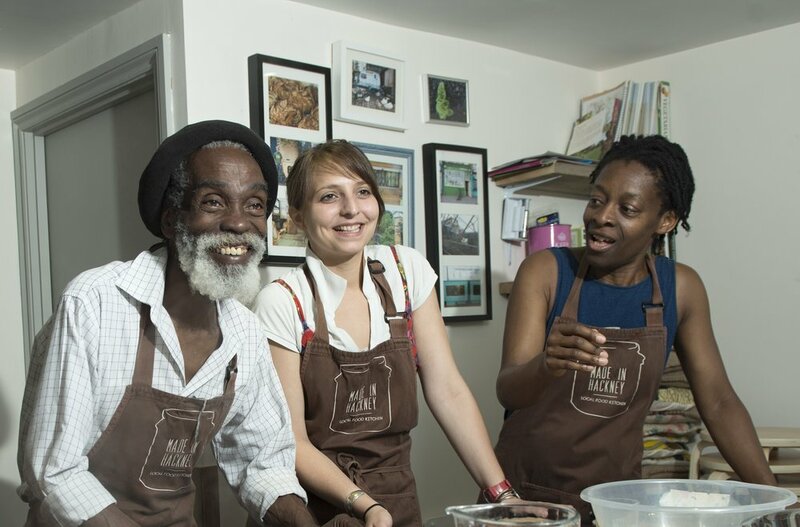 Made in Hackney are addressing so many of the food issues that society faces today - providing food education, championing plant-based ingredients and creating a safe community space for people to connect. Made in Hackney run a variety of Masterclasses at their kitchen such as Fermentation, Sourdough and Wild Cookery. Gift vouchers to these classes are available here and these purchases help fund their community programme which enables individuals from disadvantaged groups to access cookery education, develop new skills and empowers them to cook nutritious food from home. Donations to FoodCycle are used to help run their weekly projects and provide training to their teams of volunteers. Funds will help buy tea, coffee, kitchen utensils and so much more. 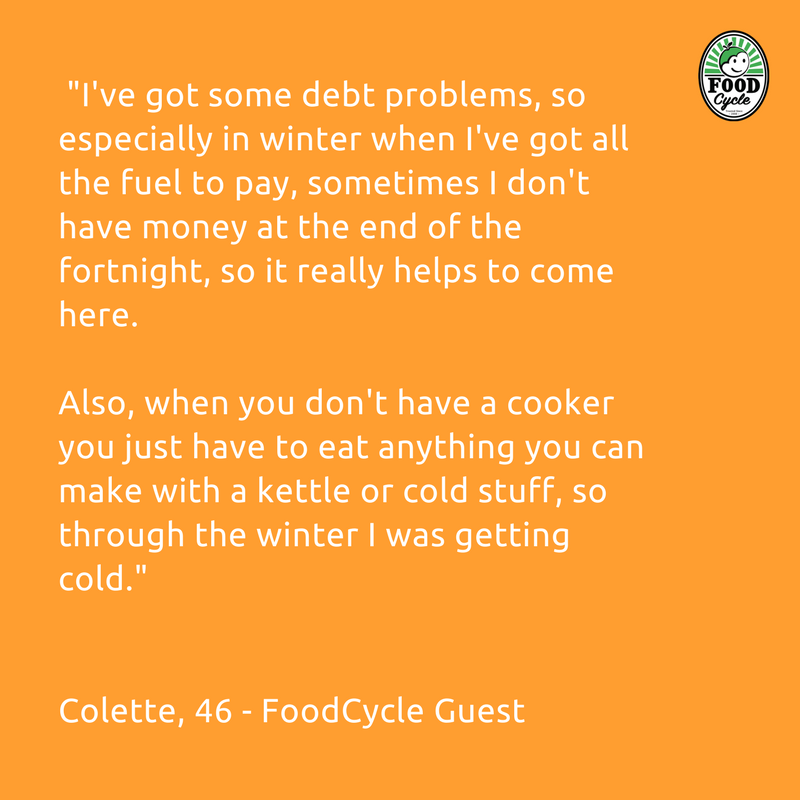 FoodCycle provide weekly cooked meals to vulnerable individuals in projects all across the UK. Volunteers collect surplus food from local supermarkets and transform it into vegetarian meals for guests from the surrounding community to enjoy.